Idaho cherry harvest starts in June of each year with cherries available June and July. 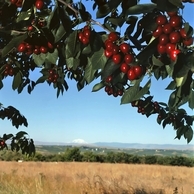 Cherry varieties harvested in Idaho include Bing, Tieton, Lapins, Sweethearts, Skeena, and Rainier. The Commission was created in 1967, and consists of two handler members and three grower members. Annual appointments to the Commission are made by the Governor. Each Commissioner may serve two three-year terms. As outlined by the Idaho State Code one of the responsibilities of the Idaho Cherry Commission is to do any and all things to promote the sales of Idaho Cherries.